Too much condensation pooling around your central AC? Follow these steps to keep your cool when your system can’t. Q: My central air conditioning system is leaking water. Any way I can DIY the repair and avoid an expensive repair bill? A: Most likely, you’re dealing with one of three things: a damaged drain pan, a clogged air filter, or a blocked condensate line. Left unchecked, these concerns could cause all sorts of unwanted costs, from repair fees and astronomical utility bills to the worst-case scenario: water overflowing from the system and flooding parts of your home. The good news is, if you catch a leak early, you may be able to remedy the situation yourself. So as soon as you notice water around the unit, begin the diagnostic process with these troubleshooting tips. First, check your drain pan. Located directly underneath your unit, the drain pan catches the condensation that emerges normally from running your air conditioner. If it’s cracked or otherwise damaged, it can’t do its job—soon after, you’ll start to notice your air conditioner leaking water. So, follow along the edges, paying special attention to the corners for breaches. (Tip: Use a flashlight for better visibility, since the cracks may be small.) Any minor damage you find can be repaired with epoxy, but it’s generally wiser to replace the pan altogether. Assess the air filter. If your pan isn’t the problem, take a look at the air filter, which is placed directly into your unit; the edge is usually visible from outside. When a filter is dirty or full, ice can form on your unit’s evaporator coils and melt into pooled water below. Most filters last for a month or two, but if your system is getting a lot of use (in summer, for instance), replacing it like clockwork every 30 days can prevent problems. If yours looks dirty—or you don’t remember when you changed it—swap it out for a new one now. Unclog the condensate line. 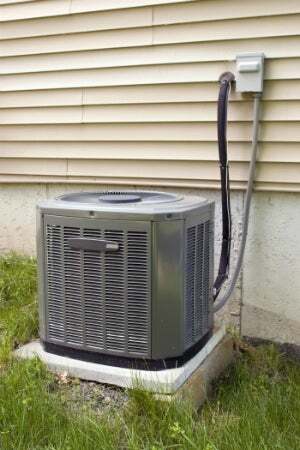 The most common gremlin behind a central air conditioner‘s leakages is a clogged condensate line. 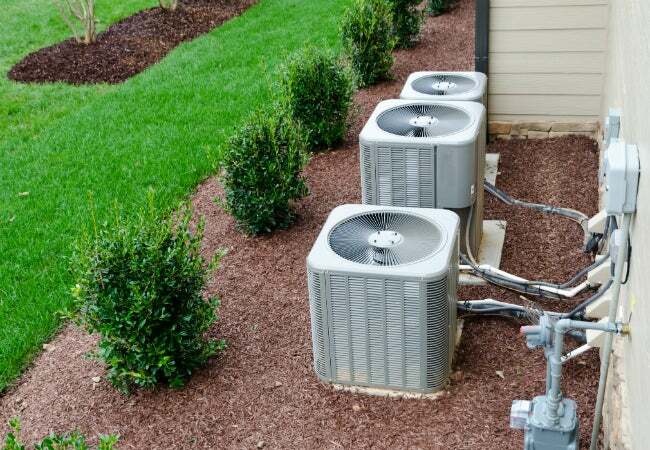 Because it’s located outside your house near your condenser, the line is subjected to the elements year-round, and algae can build up inside fairly easily, clogging it and causing a backflow. Though it requires a bit more effort than troubleshooting a cracked drain pan or dirty air filter, you may still be able to fix it yourself. First, turn your air conditioner unit off. Next, step outside and locate the line (typically a ¾-inch PVC pipe emerging from the ground near your exterior unit). Pull your wet-dry vacuum up to it and choose an attachment fitting that’s ¼-inch smaller than the condensate line opening; this should give you an airtight seal. Once you’ve achieved a snug fit, turn the vacuum on and let it run for three to four minutes. Then turn off the vacuum and check the tank for algae-filled water. If that’s what you see, you’ve likely solved your problem without having to make a service call, saving somewhere in the neighborhood of $100. In the future, running a bit of chlorine through the line every six months or so should keep the gunk from coming back and wreaking havoc on your system. Likewise, it’s smart to change your air filter every month or two and periodically check your drain pan to stave off potential AC calamities. Schedule due diligence with your system throughout the year to keep things flowing. An ounce of prevention is worth a pound of cool!